1. Spice Mix Of The Month "Basic Curry Powder Recipe"
My very first homemade spice mix was a curry powder and if you're new to making blends, this one is an excellent choice to start with. It's quite basic but will still add tons of flavours and aromas to your home cooking. Note: If you only have ground spices just use those, but reduce the amount you use by half. 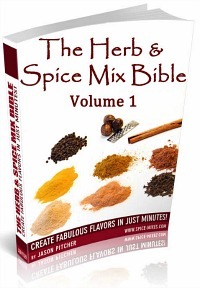 So instead of 2 tablespoons of cumin seeds, you use 1 tablespoon pre-ground cumin etc. Grind the peppercorns, cumin, cilantro seeds and chili flakes. Sieve into a bowl and mix in the ginger powder and turmeric. Couldn't be simpler! Store in an airtight jar out of direct sunlight. Use within 2-3 months. Here's a short slideshow of how I made it. Note: I had a couple of emails asking about what payment method I use for the book. I use ejunkie .com which hosts the book and payment is by paypal. 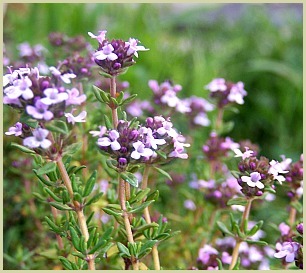 I've revamped a lot of my website and I've just finished the thyme herb pages that you may find interesting.